TiVo has let us pause and replay live television for a while now, but what if you want to do the same with XM or SIRIUS radio? 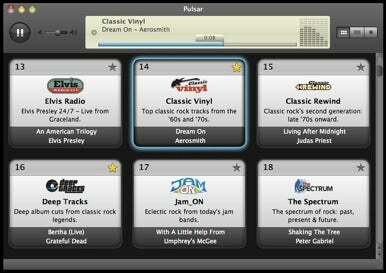 Now you can, thanks to Rogue Amoeba's new update for its XM and SIRIUS desktop client, Pulsar. Along with some interface improvements, the 2.0 update gives Pulsar the ability to pause, replay, or fast forward live radio. Pulsar, which runs on Mac OS X 10.5 or higher, lets XM and SIRIUS customers tune in to their favorite channels without having to deal with clunky Web browser interfaces. The interface of the $20 app gives you station listings, information on what is currently playing, and station artwork. You can also save your favorite channels. With the version 2 update, you can pause live radio stations, and pick back up where you left off. You can also use a new Next Song command to skip songs you don't like, or jump backwards to catch something you might have missed, thanks to Pulsar’s enhanced buffering capabilities. The Favorites list has also received some improvements. It's now accessible from Pulsar’s mini-player, and you can now re-sort the list via drag-and-drop. Growl integration has also been added to Pulsar, so you can see the currently playing song while you're in any application. Finally, Pulsar has also received an overhauled interface, with improved graphics and layouts, making for an elegant satellite radio experience.